Why study Commercial Cookery with Kenvale College? Food is a universal language and an essential part of life. The ability to create unforgettable dishes that appeal to all the senses – taste, aroma, texture and presentation, is an art. As a chef, you’re in constant demand both in Australia and around the world, with career opportunities in restaurants, bistros, catering, hotels, cruises and many more unique and wonderful places. Our point of difference is our approach to work and study. As a Kenvale student, you’re given the unique opportunity to work approximately 20 hours of paid work every week. This industry experience along with our industry-led knowledge and focus on humanity and service, is what makes you so attractive to future employers. You’re also assigned a personal mentor at the beginning of your course. Our successful mentoring system forms an integral part of your overall personal and professional development throughout the course. Our students graduate already in employment and are considered to be among the finest in the industry. 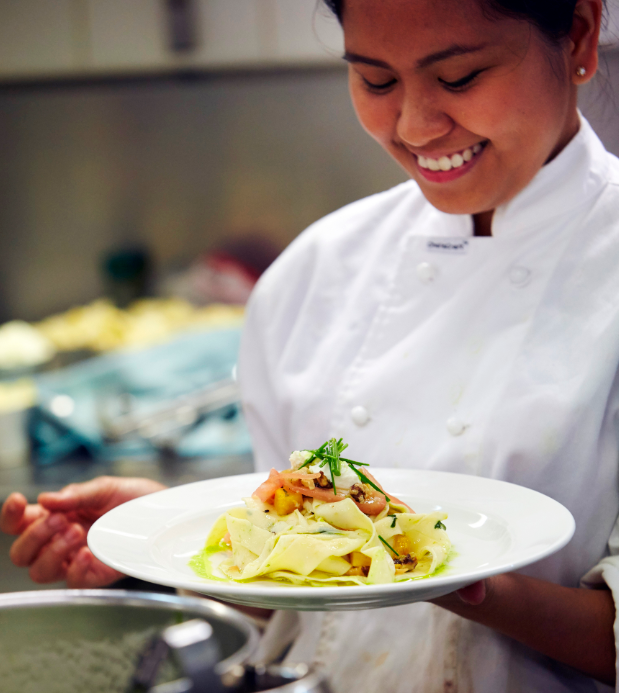 Kenvale College is proud to be Australia’s first private hospitality college. Our long history – started way back in 1971 – testifies to our experience, our reputation and our staying power. Kenvale is also an alternative pathway to universities in Australia and overseas. Throughout our Commercial Cookery courses you’ll be able to combine work and learning. You’ll also be able to gain your qualification faster than an apprenticeship and be paid at award rates. Learn from great chefs both on campus and at work. Our courses cover theory and practical components, and include subjects like Cookery Techniques, Creative Culinary Arts, Menu Planning and Development, Supervision and Team Management, Dietary and Nutritional Studies, Stock Control, Workplace Health and Safety and more. In your final semester of cookery, you’ll be able to showcase your talent at our very own Kenvale Restaurant where we invite distinguished college guests, your families and also the general public to a series of Restaurant sittings that will give you exposure to cater to à la carte, buffet and function menus. From a head chef or sous chef, to menu designer, catering coordinator, head of culturally themed menus or TV cooking show presenter, many exciting careers await you in the dynamic food industry. Commercial Cookery is creative, it’s diverse, and it can take you around the world. Kenvale College’s Advanced Diploma courses articulates to universities both in Australia and overseas. Please refer to our University Pathways Page for more details. VET Student Loans* (If you choose to take a diploma or advanced diploma and are eligible). Smart & Skilled* (Available on selected courses for those who are eligible to apply). Smart & Skilled positions are partly subsidised by the government reducing the overall cost of your fees. Please note that both VET Student Loans and Smart & Skilled positions are limited in numbers, and subject to eligibility criteria. Course fees are available under each individual course page. All students also require a chef uniform, toolkit and course materials prior to commencement. Please refer to the domestic and international ‘Summary of Fees’ documents for more information. What will my college timetable look like? Students attend classes on 2 days per week, alongside paid employment in hospitality events establishments. Our academic year is split into two semesters, which are parallel to those of universities, with each semester lasting 16 weeks. You’ll learn from industry professionals in small class sizes, which leads to a personalised learning experience. Kenvale College is next to the University of NSW campus, walking distance to Coogee Beach and Randwick shopping centre, and fifteen minutes from Sydney’s CBD. Starts the students on their journey in hospitality through professional dress which matches industry expectations. Increase the professionalism of the College and prepare students for their workplace. Admission into our courses is based on an application and professional interview. More information on how to apply. For more information or to speak to our course advisor, please contact: enquiries@kenvale.edu.au or +612 9314 6213.